Old country house from the fifteenth century, where the charm of the past is in perfect harmony with the modern conveniences. It's the first house of the town of Cascia along the provincial road towards Reggello Valdarno, a short distance from the old church of San Pietro. Thanks to a careful restoration, the original stones are recovered in the structure of the building, which is divided into seven comfortable apartments with evocative names of the area. The view of the landscape, with the rolling hills of Pratomagno, are outlined by the window frames, almost as if they were paintings. From the villa you can also easily visit the main cities of Tuscany such as Florence, Siena and Arezzo, where you can spend your days immersed in culture and typical Tuscan food and wine at local restaurants. 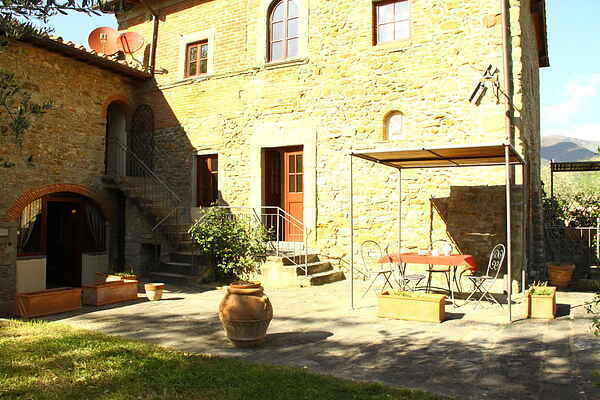 Florence is a 30-minute drive, Arezzo within less than 50 minutes, Siena 1 hour. In the villa we organize theme weeks with tastings and guided visits to places of artistic and natural beauty of this area. It is the perfect place for anyone looking for a holiday of sun, nature, history and art. If you don't want to go out, the house has many opportunities; a large garden, BBQ, pool, tennis court / football field. Perfect vacation to reach The Mall for your shopping hours. Tuscany Castle tour Around us the countryside is dotted with villas, farms and castles, if possible, a visit to the Castle Sammezzano is a must. Vallombrosa forest, trekking and Pratomagno mountains VALLOMBROSA 15 'drive. In the summer Vallombrosa fills of people looking for fresh, through beech and fir trees and its many restaurants. The abbey of the monks, well worth exploring, inside there is also a shop with products of the friars "vallombrosiani". We are at the foot of Pratomagno, a mountain range that exceeds 1,500 meters, crossed by dozens of marked trails, ideal for a day or a cool walk through the well-marked trails. Chianti Wine and food tour WINE TOUR in Chianti. Who love good wine can take a tour of the farm, where you can do tastings and buy the great Tuscan wines. Tuscan cuisine is one of the best in Italy: you can easily see in restaurants and taverns scattered in the countryside. Ask us for advice. Horseback riding For horse lovers it is easy to find equestrian centers and riding clubs, a few minutes from the farmhouse.